My household is starting off the New Year without coffee or toilet paper. I was going to run to the store, but then I saw a blog in it. When my husband wakes up in a few minutes, I may have to reprioritize, as he will undoubtedly dust off his “Staples of Life” speech. The “Staples of Life” speech is all about the things which, in his estimation, are essential to living, and as such, no Decent American Home should be without them. We have several friends and family members who have had the pleasure of listening to his views on this topic. In fact, if I weren’t the target of said rant, I would probably find it as amusingly entertaining as everyone else does. In my defense, “The Staples Of Life” speech contains a ‘floating list’ that is subject to change based on my spouse’s current unmet need. In the early days of our marriage, it was fairly succinct. As time marched on however, it morphed and grew. Suffice it to say, coffee and toilet paper will occupy premium real estate at the very top of today’s list. I see this as more of a semantics issue. Sometimes, when I’ve been too busy to swing by the grocery store, I embrace a looser definition of the word NEED. As in, do we really NEED coffee or toilet paper? There are several alternate sources of caffeine in our home. One can always brew oneself a nice soothing cup of tea or guzzle down an energizing can of Coke! As for the toilet paper- it’s a proven fact that women use it more often than men, so if I can make-do with a box of Kleenex, then he can too. With that said, I can’t deny that there are flaws in my SYSTEM of procuring goods from the marketplace. I have stubbornly refused to adopt the method that Jimmy has endorsed through the years, which involves “inventory ” using a “Master Build-To Sheet,” and “Par Levels” to aid in re-stocking with organized efficiency. I acknowledge that, while this model works in the restaurant business, it sounds way too complicated for Yours Truly. I opt for the ever-popular BROWSING METHOD which entails meandering through the grocery store, sans list, searching for cues and/or inspiration from the shelves. It’s true – I can’t always remember if we are “stocked-up” on an item, so I just buy it again. That is why we have 5 bottles of mayonnaise, 3 bottles of Karo syrup, 8 cans of Refried Beans, 6 boxes of Captain Crunch (all opened) a staggering amount of Ramen noodles. And no coffee or toilet paper. 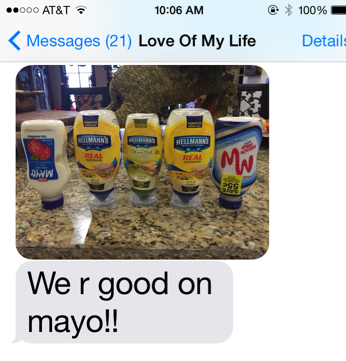 By the way, one of those bottles is “Miracle Whip,” which everyone knows is technically not mayonnaise. I will probably swing by Walmart if I have time tomorrow. But, I also think if we are truly entering 2016 resolving to be better people, we should begin by acknowledging that what we really NEED in life can’t be purchased at a grocery store, all we really need is LOVE. Send some of that mayo our way! I’ll trade you for a couple rolls of TP. Omg, having heard this from time to time over the years, it’s so funny to hear you lay it all out! Remember when SYRUP was one of Jimmys staples? You made sure to stock up on that bad boy!!! Ha!